Cheim & Read is pleased to announce an exhibition of recent work by photographer Alex Van Gelder. Van Gelder’s most recent photographic series is a meditation on death, disintegration, and decay. In subtly toned platinum prints, he takes as his subject matter glass-printed sepulchral portraits found on gravestones, mausoleums, and family tombs, depicting those now buried below. The original images, exposed to the elements, have distorted with time; their surfaces are pocked and cracked, the once-crisp features blurred as apparitions. 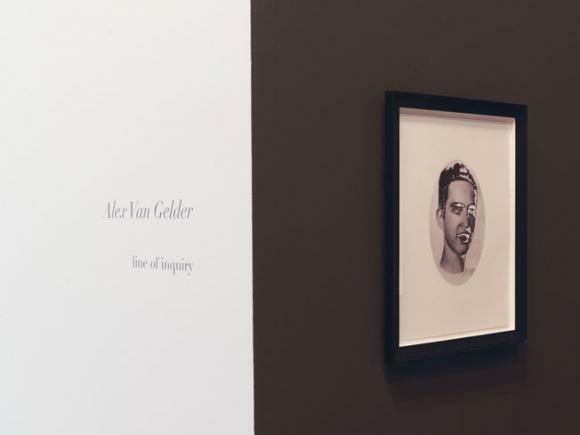 Often oval-shaped (Van Gelder retains the format), as in reference to the engraved cameo of a loved one, the portraits are memorials not only to the buried, but to the grief of those left behind. The “representation” of death and its many iterations has long fascinated Van Gelder. Past series, like this one, have depicted the effects of transformation, in turn referencing the ultimate transition from life to death. He has photographed extensively in slaughterhouses, where animal cadavers, skinned and disemboweled, have been rearranged and abstracted; their resultant beauty belies the grotesqueness of their fate. Intimate photographs of Louise Bourgeois’s hands, sinewy and gnarled, echo the artist’s sculptural compositions while also exemplifying the results of her work and age. Van Gelder’s focus on metamorphosis and transmutation reflects his deep interest in the photographic portraiture of West Africa, where he spent much of his career as a collector and expert in the genre. Specifically interested in the “death-bed” portraits of Bénin, Van Gelder brings sympathy for the culture’s belief in voodooism and animism to his own work, imbuing his images with talismanic qualities. In West Africa, many believed that the soul of photographed subject was forever “trapped” in the image, therefore providing the photograph itself with powerful connotations. Van Gelder’s images are haunting and evocative. They seem to reference the blurred black-and-white canvases of Gerhard Richter, or the poignant, almost pointillist photographic works of Christian Boltanski, sharing a sense of introspection and yearning. The uncontrolled manipulation of the cemetery portraits by outside, unseen forces confronts notions of individuality and selfhood, providing additional layers of psychological depth to their original purpose. By re-photographing photographs, Van Gelder enforces these themes: “freezing” the subject once again, he comments on the way photography is used as an aid of identity, mourning and remembrance, while simultaneously provoking this understanding by removing the circle of intimacy from which the initial images were born. Van Gelder resides in Paris. His work has been shown internationally, most recently in Zurich and Venice. His remarkable collection of West African photographs was shown in 2005 at the Fotomuseum Winterthur, Switzerland (Life and Afterlife in Bénin) and was accompanied by full-color catalogue published by Phaidon.